A farm on a hill overlooking the Bay of Fundy. Hampton Hollow Farm is a small scale spray-free vegetable farm located on the North Mountain of the Annapolis Valley overlooking the Bay of Fundy in Hampton, Nova Scotia. Through our farm, we want to contribute to our rural community while providing Nova Scotians with the option of locally grown food. We just had our garlic harvest weekend at the farm. It's our fourth year growing and harvesting garlic, and we even had some veteran harvesters this year. We are thankful to our friends and family who make this a fun weekend by coming to help us get the job done, and enjoy lots of laughs, food and drinks. Relaxing with a bonfire and camping overnight on the Bay of Fundy is a perfect way to end the day. Recently, some people have told me they don't understand why local, spray-free garlic is so expensive as compared to the garlic in Costco or imported garlic in the grocery store. One woman commented, "all you do is plant it, it grows, pull it, done". Now that I've been planting, weeding, weeding, weeding and harvesting, organizing, hanging, and selling garlic, I know the work that goes into it, and the quality of our garlic, so I thought I'd share a bit about it in this post. Preparing beds for the garlic. We rotate our crops, and garlic is a large part of this planting rotation. To prepare the beds where the garlic will be planted we apply a generous amount of composted seaweed. Then we line up stakes and rope while using the hoe to get the bed as weed and rock free, and level as possible. Erin dropping the garlic seed in the holes. We use seed from last year's harvest and/or purchase some seed varities from a reputable garlic seed provider. We put each clove in the hole the pointed side up. You must be careful to not lose your place, put two in one hole or place them the wrong way up. Garlic Seed we saved from last year. Finally we cover over the beds. In the next few weeks we mulch the beds with straw to prevent frost heave and to protect them from wind and exposure. Then we wait! In the Spring we start to see the garlic pop up. For the next months we weed. We get all kinds of weeds that can threaten the garlic. Some climb up the stalk, some try to choke out the garlic, some try to take over. Weeding takes a lot of time as we don't use any pesticides or herbicides to keep the weeds down. Eventually, as the garlic grows, garlic scapes start to emerge on the stalk. We cut the scapes off once they curl twice in order to divert the energy from formation of a mature nutrient dense bulb. We leave a few scapes on and encourage small bulbils that can be planted to grow more garlic, but it takes 2-3 years for them to form large bulbs. The scapes and bubils are the seed head part of the hardneck garlic plant. They taste just like garlic and are delicious. 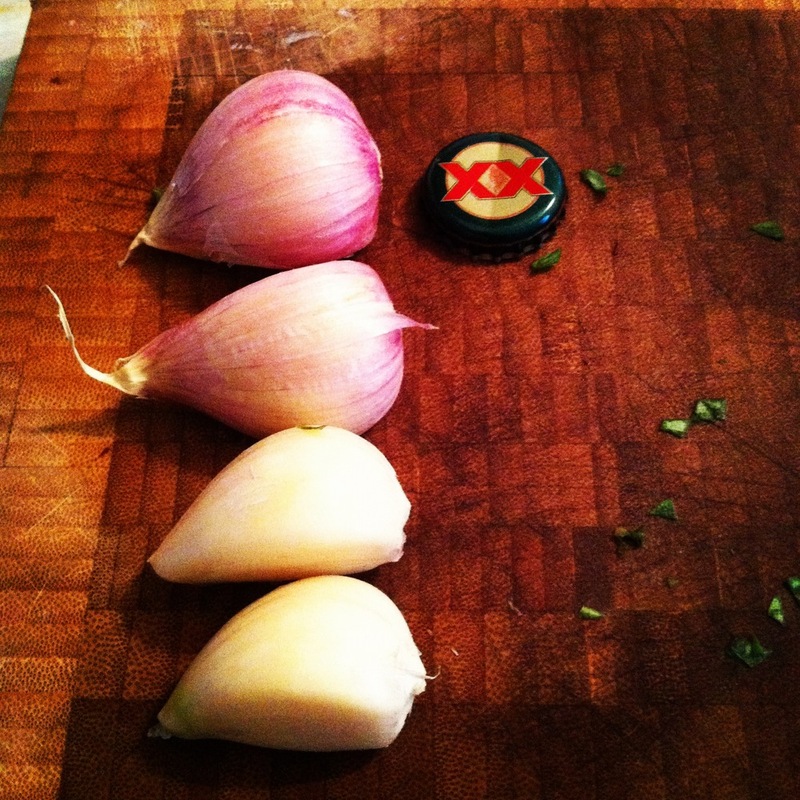 We use them in stir-frys, fish, pizza, eggs, just about anything we'd use garlic in. There are a lot of great recipes for scapes out there including this one. Weeding, weeding and more weeding. Different growers have different rules of thumb when it's time to harvest their garlic. All areas can be different. You can scrape away the dirt from a few bulbs and feel the bumps of the cloves through a mature wrapper. When the garlic is a good size, and before the wrappers start to deteriorate, or the bulbs crack, it's time to harvest. For our area it's usually early to mid-August. Each year as our garlic crop grows, along with our amount of harvesters! This year we were lucky to have 16 of us harvesting. Many hands make light work! 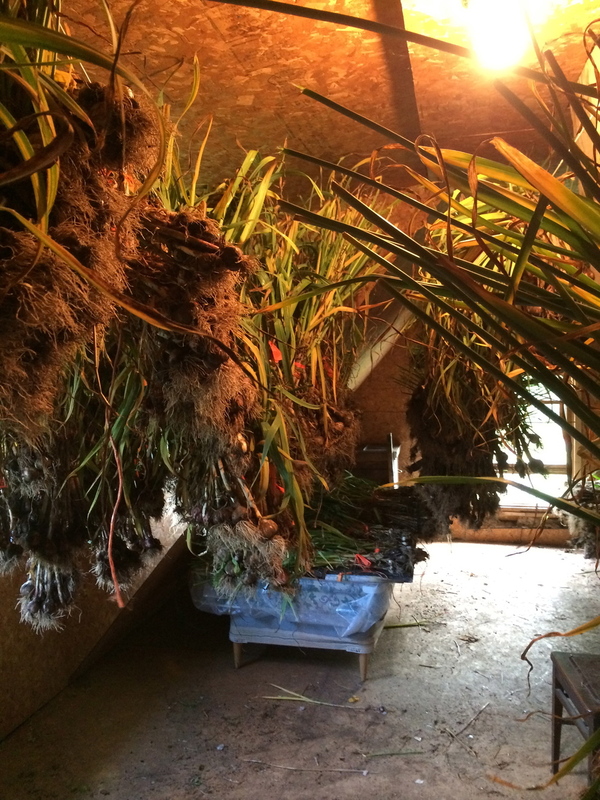 Once we harvest the garlic we hang it in our attic in bundles. The attic has great air flow and we have an industrial fan to dry it for a few weeks. When the garlic is dry, we clean the dirt off of it, trim the roots, cut off the stalk and sort to size to ensure quality control. We record all of this to compare the next years crop. We have 15 varieties this year so we have to be careful to tag it correctly so it doesn't get mixed up. Once it dries for 2 - 3 weeks it has cured and it's ready to enjoy. Most of our garlic varieties can last for 7 - 10 months if stored properly. So there you have it, growing garlic is just not putting it in the ground, letting it grow, and then pulling in it. A lot of work goes into it. Have you tried local garlic? The flavour is so much better, stronger and the cloves have more oil than imported garlic, that you often have to use less in cooking. Try it, you won't go back!